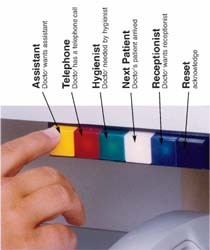 Communication systems for dental and other medical offices which use colored lights to relay messages between the doctor and staff. Status Indication - The Theta Room Status System and One-Lite Status System provide continuous display of the status of locations within an office. Panels with toggle switches are placed at the locations where the situations exist. Display panels are placed in locations in the office that personnel need to be able to observe the status indications.